2. 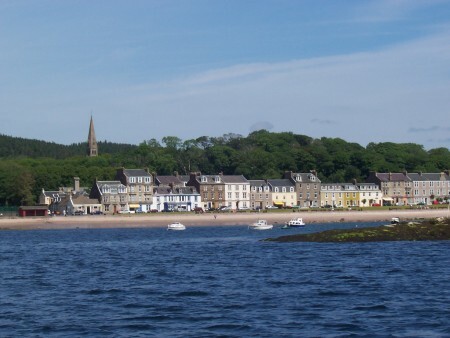 Millport is one of the prettier seaside towns in Scotland. The seafront Victorian architecture, the long promenade, the old-world cafes and slower pace suggest its Victorian heyday, but the Glaswegian visitors and chip shops bring you back to reality. It is home to the smallest house in Britain, the smallest cathedral in Europe, and (apparently) the friendliest welcome on earth. According to the Millport Community Website it's one of the few remaining places where you will leave feeling refreshed but sad to go. This is the view north, looking onto the main beach. A reasonably safe and clean place for the kids to play, its a good place to walk with the ice cream. Along the same stretch you can find the Crocodile Rock, rears out of the sea at the Crosshouse end of Newton Beach. When the tide is out, the Crocodile lies there on the stony beach, grinning at all who pass; but when the tide is in, and especially when there is a rough sea, he takes on a fearsome aspect, which is nevertheless well loved. This page has been viewed 5711 times.